We’ve been working on our house, it feels like non-stop. Some days walking in there is so… almost depressing, but some days it feels like nothing is happening. It is… but it’s happening up in the attic where you just don’t see results other than more lights are popping up as well as electrical plugins. Oh… and an HVAC system. Heat… let there be heat!! So we’ll attack this in a bit of a breakdown. 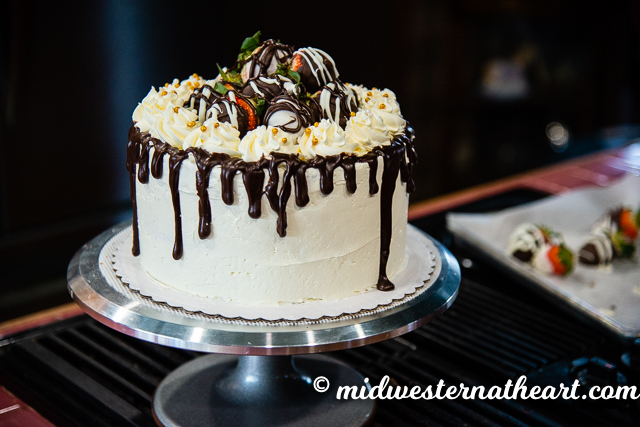 Because if you saw the title of the cake… There’s a LOT going on. So the cake first. So she needed something special, right? That’s when I decided, why not a Triple Chocolate Cake (I doubled this recipe). This cake has 3 layers. A White Chocolate, a Milk Chocolate, and the bottom layer is a Dark Chocolate. Three chocolates. When I made the cakes, I was kind of in a hurry so no pictures. We took a break from working on the house because Jared needed help. So I came to the house and got a start on Shelby’s cake. I’m here to tell you that a Swiss Meringue Buttercream is so much better than an American Buttercream. #truth! An American Buttercream is just powdered sugar and butter plus a few other things like milk/water and flavoring. There you go. The other day, when I was contemplating my buttercream options, I realized I’m not the biggest fan of powdered sugar. Is that weird? I also decided that a Swiss Meringue Buttercream was more “fancy” and since 21st birthday, why not go fancy? Here’s where the fun begins… I found a Swiss Meringue Buttercream recipe that was… well… weird. Let’s explain… I followed the recipe to a T and it came out WAY. TO. BUTTERY. That sounds weird because is there a thing, but the answer is, yes. So I walked away from the buttercream and went to town to pick up the little. When I got back, I had an answer. While waiting for her, I googled multiple recipes. Found out that the one I used, the ratio was wrong, I doubled my base, mixed together, and BAM! I saved it. A few weeks ago my friend Jody and I went to my grandma’s house for a Strawberry Jam making lesson. 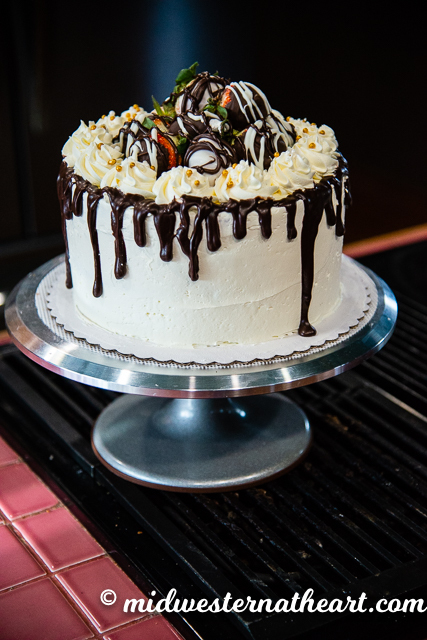 When I was contemplating a filling I tossed back and forth the idea… just use buttercream or use a filling. Then I decided on that Homemade Strawberry Jam. I really wanted to top the cake with chocolate covered strawberries. 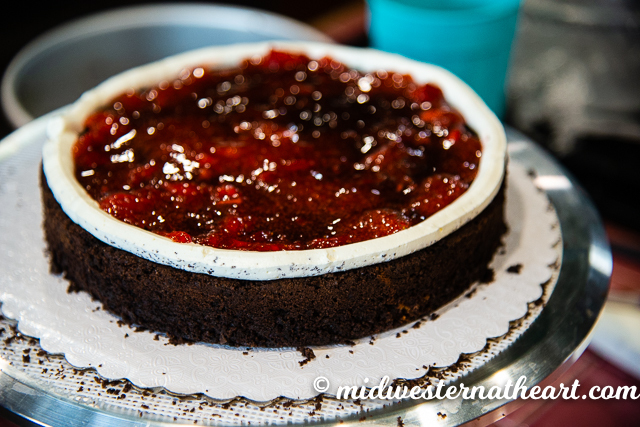 That’s when I decided the strawberry filling would be a great addition and help tie those in. Okay, so it’s not quite Valentine’s Day yet. Truthfully, chocolate covered strawberries scream Valentine’s Day to me, but let’s be honest… Chocolate Covered Strawberries are just very elegant all year round. 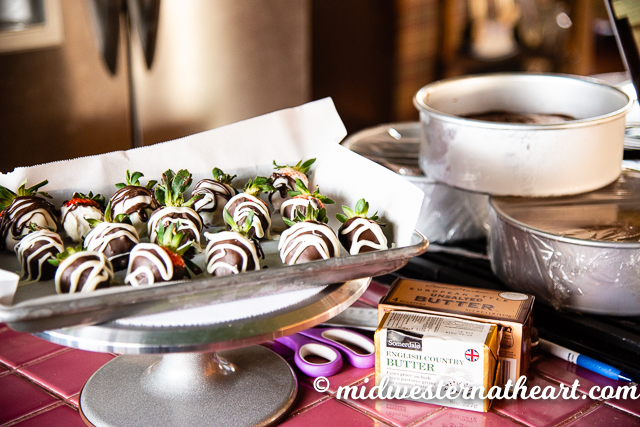 I really wish my friend Donna lived closer, I need help on pretty chocolate covered strawberries. She’s great at them! She lives across the state though so sorry Shelby, you get what you get and hopefully don’t pitch a fit. haha. This was actually a last minute thought. Why? Well, after I had the cake all assembled and iced, it looked a little bland to me. So I grabbed some gold and white sprinkles and that didn’t help. I had some leftover chocolate from the chocolate covered strawberries, so I decided to make a quick chocolate ganache. So there we have it… a…. That’s a Mouthful! but I hope Shelby had a great 21st Birthday! !